In a month when the weather starts getting golden with long spells of warm sunshine, my obsession with Birchers will return. But in the mean while, a pot of coconut soaked chia with spice roasted rhubarb is warming some of my nights and most of my mornings. 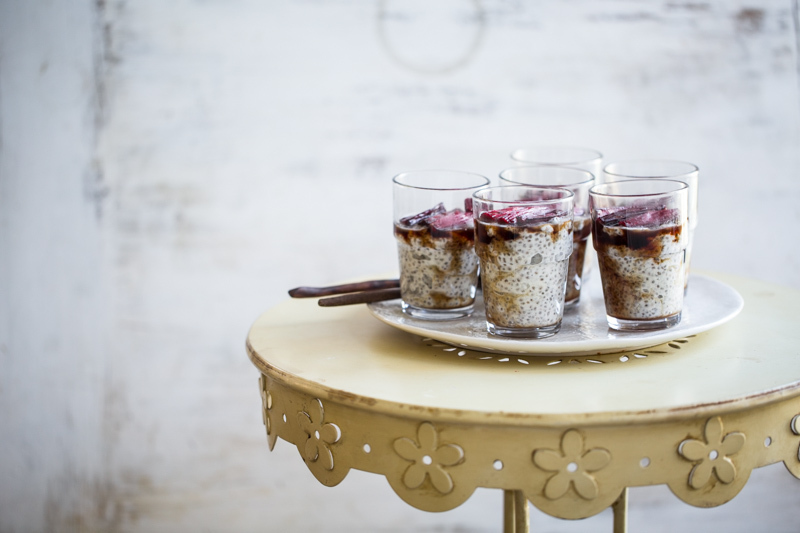 A decadent pudding which allows you to drastically up your chia intake in the most delicious manner, this parfait is a clever little thing. It requires zero cooking and happily soaks itself to a delightful consistency. 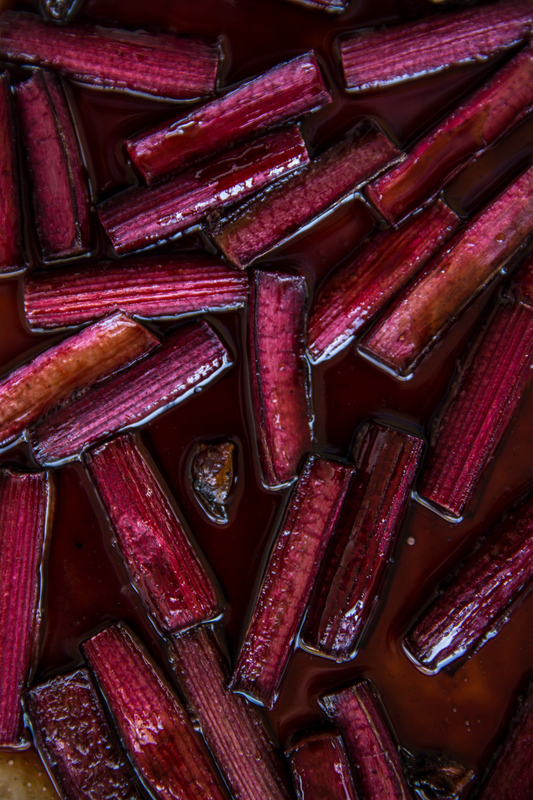 The roasted rhubarb is sensational with a bit of star anise added during roasting. A handful of strawberries might be well received here too. I have often found the ratio of chia to liquid to be extremely temperamental depending on the liquid being used. Important things to note while making a chia pudding is that once the liquid is added, you must cover it. If prepping in advance, it is best to set in jars with lids or glasses covered tightly with cling film. If the pudding is exposed to the elements after preparation, it runs the risk of drying out especially because the solids in coconut milk harden over time. 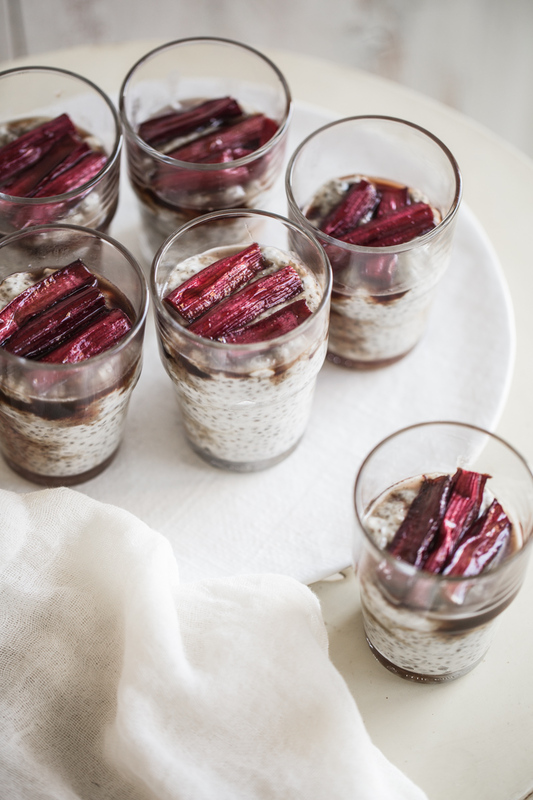 A delicious no-cook luscious dessert of coconut soaked chia seeds and layers of ruby red roasted rhubarb is perfect for weeknights on the couch. This layered healthy treat also works a charm as a decadent breakfast. Place 400ml coconut milk, coconut water, chia seeds and maple syrup in a large bowl. Mix well with a balloon whisk. Cover and refrigerate for 3 hours. Pre-heat oven to 180C. Line a small rimmed baking tray with baking paper. Wash and dry the rhubarb stalks. Cut into 4cm pieces. Place in a bowl with the sugar, maple syrup, vanilla and anise. Mix well. Pour on to the prepared tray and spread evenly. Roast in the pre-heated oven for approximately 20 minutes until tender and syrupy. Remove from heat and allow to cool completely. 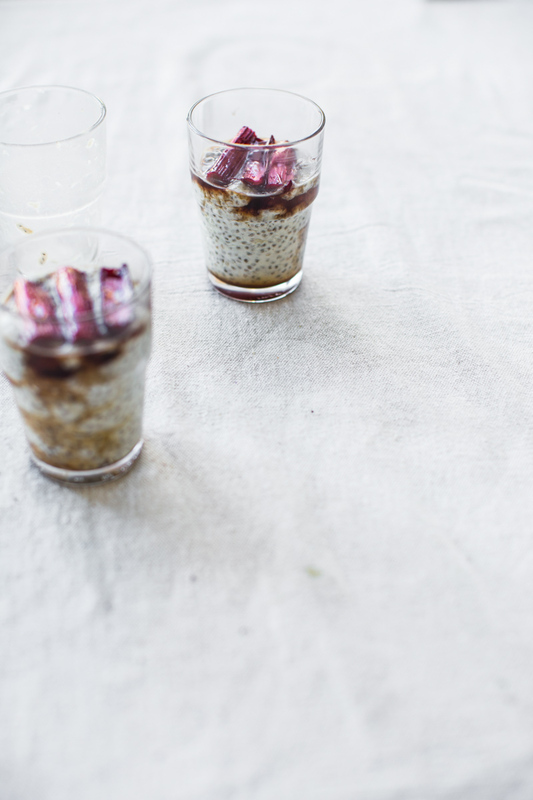 When ready to assemble, stir through another 400ml coconut milk through the chia pudding to loosen it up. 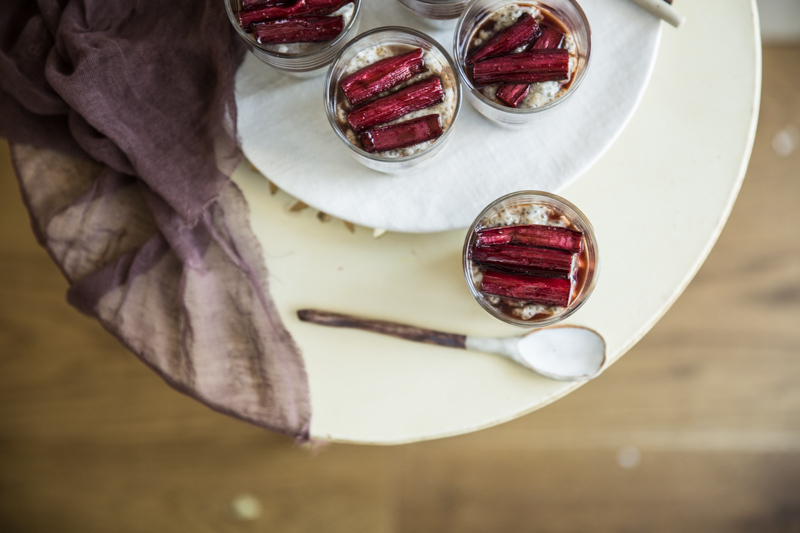 Layer chia and roasted rhubarb in six small glasses (150ml capacity each). Drizzle some of the syrup over assembled parfaits. Refrigerate until ready to serve. These parfaits can be layered in small ball mason jars and covered with a lid for breakfast on the go. If the pudding feels a bit lumpy after the second addition of coconut cream, add a bit of coconut water to loosen it some more. Coconut cream can be subbed with coconut milk. I find them both to be almost the same. 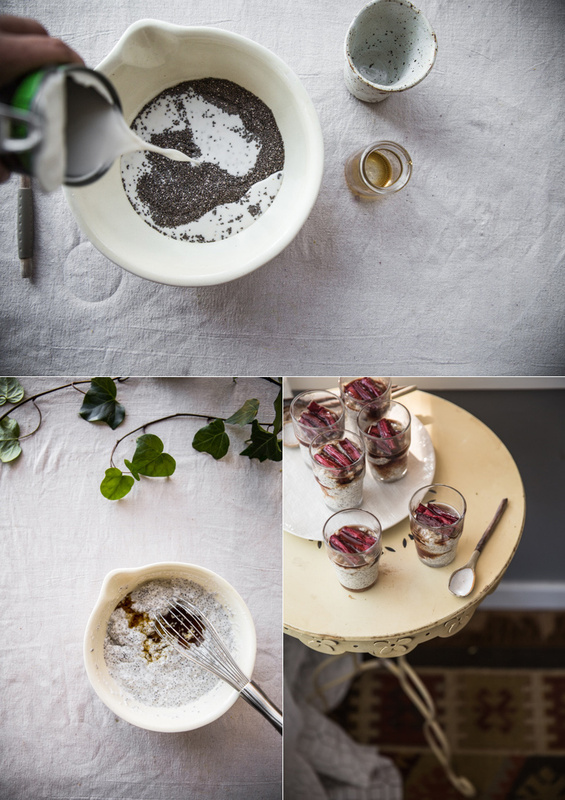 This is one of the most beautiful renditions of chia pudding I’ve ever seen! The roasted rhubarb component sounds incredible… I hope you had a great weekend, Sneh! A healthy and delicious dessert! I am not familiar with rapadura sugar. Could you give me some insight via email please?